Kathy Hamm, the Executive Director of DCTC, is an Army Spouse. So she knows – first hand – the challenges that can come with being a military family. That’s why we at DCTC are passionate about supporting Military Service Members, Veterans, and their families. No matter which branch of service you served in, no matter which wars you fought, no matter your injuries, or medical situation, or mental health status: if you are active duty, a veteran, spouse, or a family member of someone who has served our country in any capacity – Dream Catcher Therapy Center is a place where you can feel respected, safe, and understood on your journey towards healing and reintegration. 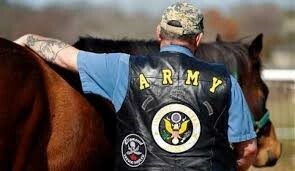 In a press release article from September 11, 2011 entitled “EAGALA Military Services Launches Helping Veterans, Active Military, their Families, and Families of the Fallen Combat PTSD, Trauma, and Behavioral Challenges Through Equine Assisted Therapy,”Jimmy L. Walters, COL, USA (Ret) stated: "The EAGALA Model uses the horse to gain insight into behaviors and perceptions. 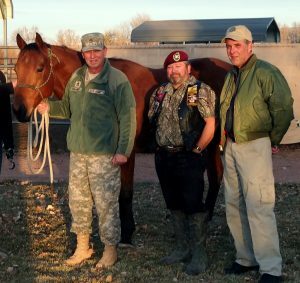 The horse's reactions provide unbiased and real time feedback, breaking through the barriers that many military members experience in conversations with others who cannot begin to understand what we feel because we made it back. EAP provides a strategy for dealing with trauma in a way that makes sense to military service members.” (SANTAQUIN, Utah, PRNewswire-USNewswire). Unlike therapeutic riding, EAGALA model EAP utilizes ground-based activities where horses serve as metaphors, such as representing relationships with family or unit members, fears, strengths or aspects of self. This new state of the art therapy program will pair qualified Veterans recovering from the traumas of war with wild Mustangs that have been ripped away from their homes and families. Together they will train with world class trainers and therapists, bonding, learning to trust each other and learning to work together, building confidence and life skills. Donating to this project will help us create a world class therapy program for our veterans from Colorado returning home tattered and torn from war.